Welcome to the web site of Merrilyn Beagles. We are Kennel Club Assured Breeders, now based at Gowdall in the East Riding of Yorkshire. Our Beagles are our pets and we have been showing and breeding these wonderful hounds since 2005 We generally breed to produce our own show dogs and therefore only occasionally have puppies for sale to approved homes. 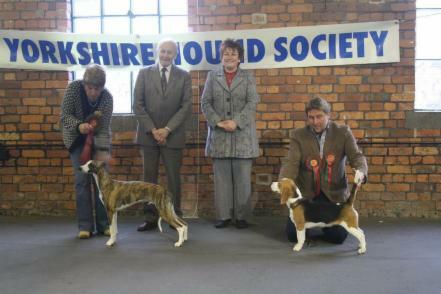 Our hounds are chosen carefully for type and temperament. Please enjoy looking around our website to see photos of our previous litters please see our puppy page. Merrilyn Get Off My Cloud qualified for Crufts 2016 at The Hound Show. Merrilyn Beagles have moved house and are no longer associated with Holmewood Kennels! Congrats to Terri and John at Meala Beagles where Merrilyn Last Summer of Meala has had a beautiful litter of 5 puppies! 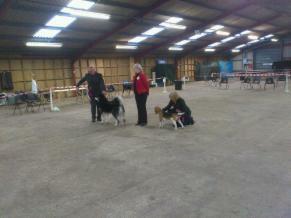 Congratulations to Christine Lewis of Fallowfield Beagles on achieving Barney's 3rd CC and becoming a Champion! Now Ch Fallowfield Barney!! Nick Morgan gets Reserve Best Puppy in Show at South Yorkshire Hound Association Open Show with Merrilyn Homeward Bound at Brydea (Mist). Well done from all at Merrilyn Beagles!